John Henderson is a value-focused IT leader with a wealth of success directing broad-based enterprise business, clinical and technology operations. He is known for guiding cohesive teams in design, deployment, administration and enhancement of enterprise IT applications and infrastructures. He is currently the Vice President and CIO of Children’s Hospital Orange County. He is responsible for the Information Services Department operations for hospitals, physician practices, clinics, health plan and other non-healthcare related activities. 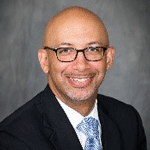 Previously, he was the Assistant Vice President at Texas Children’s Hospital where he contributed to the hospitals growth of $400M revenue to over $3B, improving productivity and reducing costs. In 2011, he received the CIO 100 Innovation Award which celebrates organizations and their IT teams for using technology in innovative ways to deliver business value. Henderson is a member of numerous professional associations in addition to SoCal HIMSS, including College Healthcare Information Management Executives (CHIME), American College of Healthcare Executives (ACHE), Children’s Hospital Association and Association Executives Healthcare IT Applications (AEHIA) where he serves on the advisory board.